The National Varroa Mite Eradication Program (NVMEP) is seeking public assistance to locate roosts of rainbow bee-eaters in the Townsville area. The program uses a variety of surveillance methods to detect Asian honey bees, one of which relies on the rainbow bee-eater birds, which occur throughout Townsville. 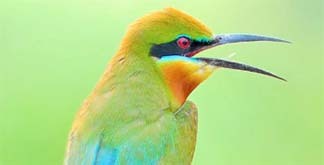 As all beekeepers know, bee-eaters love to eat bees. They also roost communally in the same trees each night and, like owls, they regurgitate pellets of indigestible prey fragments. If the roosts can be located, numerous pellets can be collected from the ground under the roosts, and a single collection of pellets can contain hundreds of bees. Pellet collections give valuable samples of the bees present in the areas surrounding the roosts. Laboratory analysis can determine if Asian honey bees are present by examining the forewings in the pellets. Success depends on locating as many roosts as possible. Biosecurity Queensland has received generous assistance from organisations such as Birdlife Australia, and is also seeking any reports from members of the public. Roosts can be identified as the bee-eaters gather close to the roosts in the 30 minutes before dusk. Their appearance, and calls in flight as they gather, are distinctive. If you see bee-eater roosting activity, please let us know by calling 13 25 23 or emailing [email protected]. Varroa mites (Varroa jacobsoni) were detected in feral Asian honey bee nests in Townsville in mid-2016. The mites are a serious pest and a threat to the Australian bee industry. Certain species and strains of varroa mites can infest European honey bees, killing off hives and severely affecting honey production and pollination services. The NVMEP has been established under the Emergency Plant Pest Response Deed to eradicate V. jacobsoni from Australia, and is being implemented by Biosecurity Queensland on behalf of government and industry cost-sharing partners. No varroa mites have been detected since July 2016 and no Asian honey bees have been detected in the Townsville area since November 2016. On 1 April 2017, the NVMEP transitioned from the ‘eradication phase’ to the ‘proof of freedom phase’. If no further varroa mites are detected between now and 31 August 2019, the NVMEP will seek to have the pest declared eradicated. Please report any bee-eater roosting activity seen in the Townsville area, including unusual bees seen foraging on flowers, or as swarms or nests. The Asian honey bee is approximately 10mm long, with yellow and black stripes on the abdomen. Call Biosecurity Queensland on 13 25 23, email [email protected], or use the online reporting tool. More information on Asian honey bees, their appearance and associated symptoms once infected with varroa mites is available online at www.daf.qld.gov.au/business-priorities/biosecurity, or view the varroa mite pest alert.